Registration for the ZR-1 Gathering is now open on the National Corvette Museum's Website, where you will find the latest schedule of events. The HPDI Course has been sold out, however you can still put your name on the waiting list should a seat become available. Check out the Registry Store for more information. Few Remaining Seats Available for the ZR-1 Gathering HPDI! The response from Gathering attendees has been positive, with only 2 seats remaining in the High Performance Driving Instruction course on May 15th, conducted by the NCM Motorsports Park staff - home of race car legends Mitch Wright and Andy Pilgram. This is an outstanding opportunity to spend time with one of the driving instructors and learn how to safely navigate the Motorsports Park Track at speed. You must be a member to participate in this event. Check out the Registry Store for more information. Membership has its benefits! ZR-1 Net Registry Members can sign up for the National Corvette Museum's HPDI on May15th preceeding the ZR-1 Gathering event, at a super low price available in the Registry Store. You must be a member to participate in this event. Check out the Registry Store for more information. 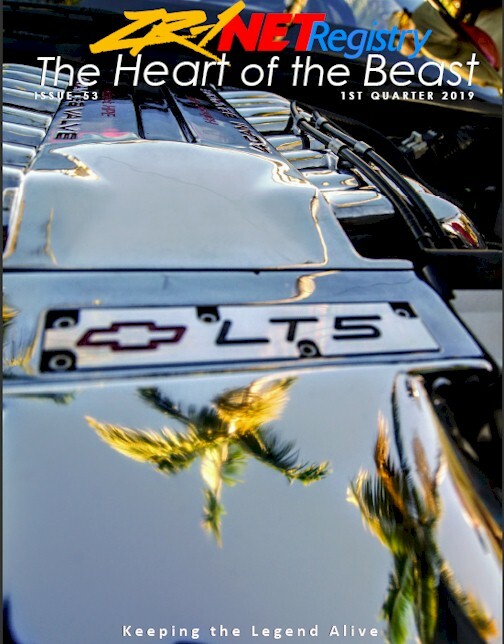 The ZR-1 Net Registry announces its 2019 theme as "The Legend Lives", honoring those who actively bring out their ZR-1s and "Keep the Legend Alive" through participation in shows, races, NCRS events, including driving their ZR-1 daily. We are looking for additional members of the 100,000 mile to highlight at this year's ZR-1 Gathering at the National Corvette Museum. If you are not already listed on the 100,000 mile club listing, please email John Glyder at membership@zr1netregistry.com. This year, the ZR-1 Net Registry is expanding events - We'll start out in Texas, then California, Alabama, Tennessee, Kentucky, Connecticut, Colorado, Nevada, and conclude in Pennsylvania. We are always looking for additional venues to get together. Please contact our Events Chair, Bob Lambe at events@zr1netregistry.com if you are interested in coordinating a ZR-1 Net Registry event! It's Fun! Interested in assisting with ZR-1 Net Registry operations? We're always looking for members who can contribute time and talent. Please email Mark Horner at president@zr1netregistry.com and let us know. Missed the South Texas BBQ? While there are a few parts that are a little hard to find, this is really not surprising with a car this age. It's commonality with the base C4 helps and specialist LT5 parts are generally available in either new or reproduction stock. The Registry community can help you find the best sources for parts from among these dedicated suppliers. The ZR-1 is far from being slow. In fact it's as close as you can probably get to a 'sleeper' 'vette. With modifications it can easily be taken to above 500 horsepower and similar levels of torque. All LT5 engines were subject to a 'torture test' of 200 hours, varying from running at peak torque to peak horsepower. In the 1990 record breaking runs a stock ZR-1 ran 24 hours continuous at an average speed of over 174 m.p.h. The registry maintains a special 100,000 mile list of cars that have reached this milestone with no major maintenance work and several cars have gone as high as 200,000 miles! The majority of the ZR-1 is identical to the base model C4s. The unique quality of the car lies in the LT5 engine. Many people successfully work on their own vehicles with the help and information provided by the Registry.